HelloFresh is facing endless competition with 150 direct competitors. This year, it sought to expand its markets and one way was through retail exploration. This year, Albertsons partnered with Plated and Kroger partnered with Home Chef. With this accelerated development, the brand asked itself how will these DTC brands have the advantage. And in adjacent categories like last-mile delivery, there has been great upheaval and a lot of experimentation with companies like DoorDash and Postmates. The innovation this year was to form a retail division with Stop ’n’ Shop and Giant, and it is now a few months into this journey. The brand had to ask itself, Should it be the same product [as the subscription]? What is the in-store communications plan? Is it a new customer it’s after? The product is a single meal for two, which provides at least three meals, Fitzgerald said. It doesn’t change recipes as frequently as the subscription model does. It’s a one-off purchase that allows for trial. It feels and looks like a meal kit, extending the brand’s equity. HelloFresh learned how to blend its core strength with a new channel to drive awareness and trial. It used a lot of email messaging as well as paid social ads on Facebook to drive coupon download. “We love the variety of content that can be distributed on Facebook,” Fitzgerald said. “Formats can change weekly. We can work with influencers. There’s the ‘dwell’ time.” The brand likes TV and direct mail, too, and is trying to make radio work. It tried but could not make Snapchat work. Retail has its own media needs. The retailers requested OOH, radio, billboards, and local TV, which are “a little out of our sweet spots.” A strong partnership with the retailer determined shelf setups and location in-store. The new customer at retail may not be a tech-forward person. Educating people on the concept, the USP, is a communications challenge. HelloFresh was co-marketing for the first time. 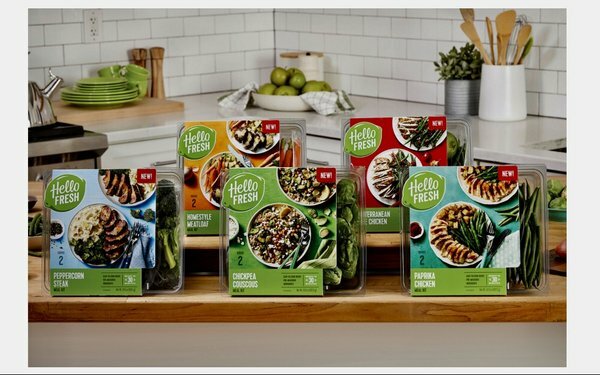 Colavita partnered with on-pack messaging to “create a new habit” by making HelloFresh a part of one’s weekly checkout. Since the brand’s history was to try everything digital, it had to get used to a slower feedback loop in retail. But on-pack, in-store and OOH offered a wealth of opportunities. Communication needs are completely different in retail channel. Must understand that environment and how to drive consumer engagement there. Product fit must be strong and may not be identical to current DTC offering. New-to-category customers must be educated on the product concept. Open a new revenue opportunity.